depending on their size. Sizes range from small 1 foot diameterby 5 feet long cleaners to large roughers 8 feet in diameter and 40 feet long. 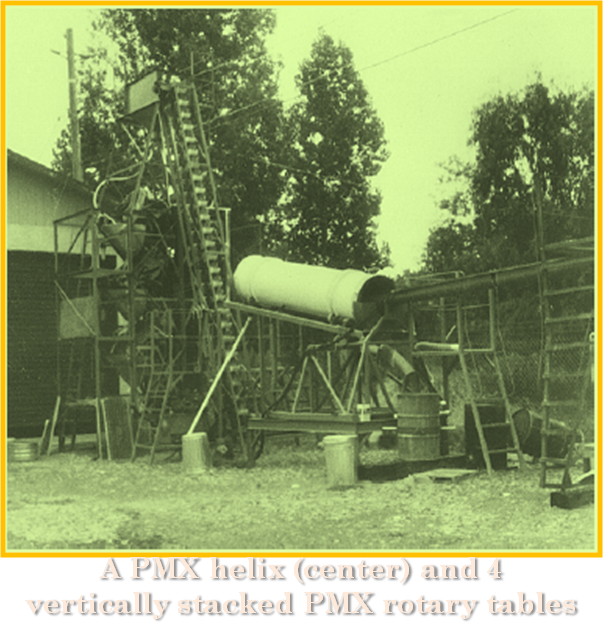 The principles of mineral separation for helixes are similar to those for rotary tables. The spirals that line the inside of the cylinder are situated such that heavy material is carried towards the front of the unit during rotation. Feed is introduced abouthalfway into the unit. Wash water is delivered by a spray bar from the point of feed entry to the front end of the helix. This water is sprayed towards the back end of the unit. As the helix rotates clockwise, the water spray washes lighter material over the spirals and out the back end. 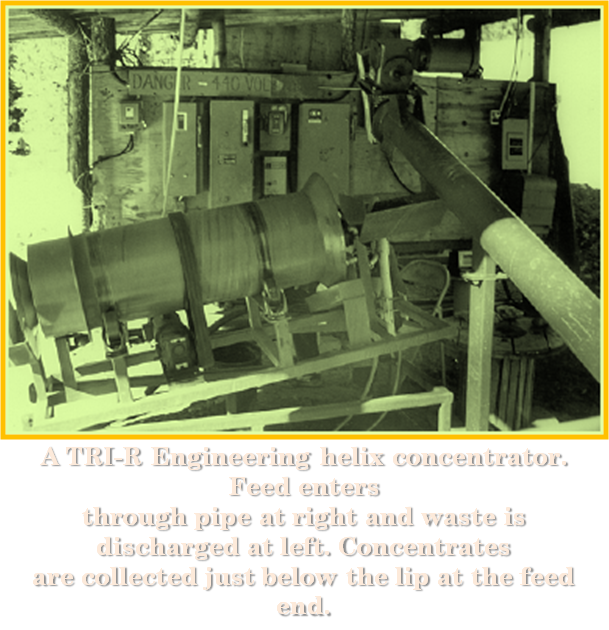 The concentrate is directed by centrifugal force and gravity into the troughs of the spirals and is carried to the front of the helix where it is collected. In aMsmall helix manufactured by TRI-R Engineering, additional wash water is supplied at the front of the machine by two sprayers. This prevents moderately heavy particles from discharging and results in a higher percentage of gold in the final concentrate. Feed enters through pipe at right and waste is discharged at left. Concentrates are collected just below the lip at the feed end. Rotary spirals and helixes are becoming more accepted as elements of gold recovery systems. They are relatively simple to operate and have a low capital cost. Helixes are suitable for all phases of mineral recovery and, like rotary tables, can recover a very high percentage of fine gold. These units should be seriously considered in gold recovery system design.